"Pandit Jasraj told the audience that it was Atal ji who first called him Rasraj. That was the upadhi (title) that Pandit Jasraj loves most," author of his biography, Sunita Budhiraja said. 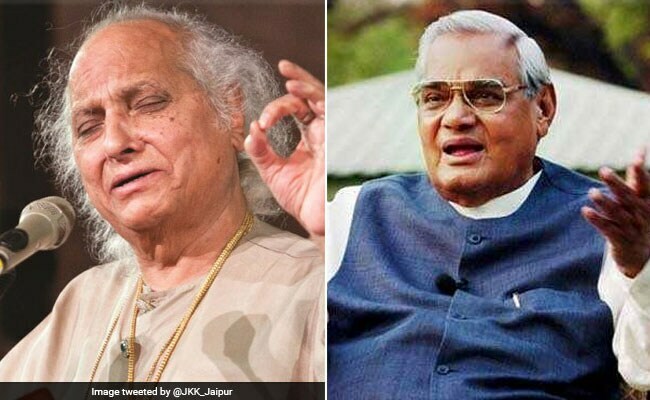 The late Atal Bihari Vajpayee, a connoisseur of poetry and music, was a fan of the 88-year-old Hindustani classical vocalist Pandit Jasraj and called him 'Rasraj' (King of Rasas). "Pandit Jasraj told the audience that it was Atal ji who first called him Rasraj. That was the upadhi (title) that Pandit Jasraj loves most," Ms Budhiraja told news agency PTI. Sunita Budhiraja said Pandit Shivkumar Sharma, noted Indian classical musician and 'Santoor' player told her that among all the honours and titles Pandit Jasraj has received, 'Rasraj' is the one he likes the most. "Atal ji lives through through the music of Pandit Jasraj and the title of my book," she said. While at the AIIMS, Atal Bihari Vajpayee listened to old film music and poetry on the AIR FM Gold radio station, she said. The 534-page book has incidents and anecdotes from Pandit Jasraj's life, from his tabla-playing days to his journey of becoming a renowned vocalist. The Mewati-gharana music maestro was honoured with the Padma Shri in 1975, the Padma Bhushan in 1990 and the Padma Vibhushan in 2000.